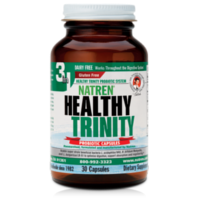 Healthy Trinity from Natren contains the same three probiotic strains as the Healthy Start System in an amazing 3-in-1 product. The secret is an Oil Matrix System that combines all three dairy-free super strains within a single gelatin capsule. It is the perfect probiotic supplement for those who want to simplify their health regimen while still obtaining their full complement of friendly bacteria.